Job growth in March was worse than originally estimated but bounced back in April. The Bureau of Labor Statistics (BLS) reported that payroll employment expanded by 223 thousand in April. Job gains in February were revised upward by 2 thousand to 266 thousand and the March figure was revised downward 41 thousand to 85 thousand. The unemployment rate slipped to 5.4% from 5.5% in March. The bounce back in payroll growth is a reassuring signal that the March decline was an aberration, it will certainly be well received at the Federal Reserve (FOMC). The weak March payroll numbers combined with a disappointing surprise in the first quarter GDP growth reported last week, 0.2% down from 2.2% in the fourth quarter (GDP), are not the confidence-bolstering signals the Fed is looking for to support its stated desire to begin raising interest rates later this year. The rebound in payrolls in April will help keep those plans on track. 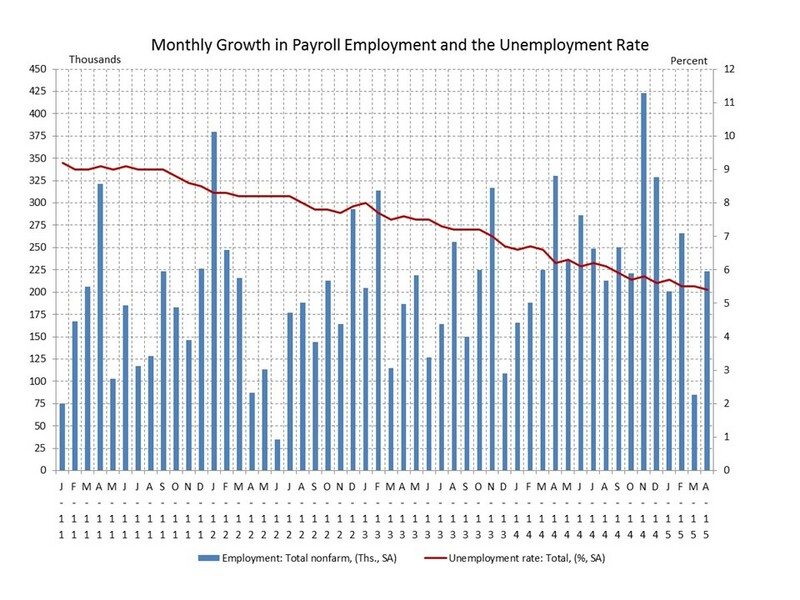 The rebound in payroll growth is good, but the decline in the unemployment rate is less than it appears. The BLS characterized the rate as “essentially unchanged at 5.4%,” and with good reason. The household survey showed the labor force expanded by 166 thousand, the number of employed persons by 192 thousand and the number of unemployed persons declined by 26 thousand. Unrounded the unemployment rate fell from 5.46% to 5.44%. A difference of 12 thousand would have left the unemployment unchanged on a rounded basis. Today’s report was good, could have been better, but could have been a lot worse.